I will admit that I have a sweet tooth. And I like to bake. A dangerous combination. Now, I don't consider myself a boastful person but I do know in what area I can confidently say I got me some skillz. I have cupcakes down pat. Cookies on the other hand... not so much. Cookies were always kind of my nemesis; every time I tried my hand at the most basic chocolate chip cookie recipe, I failed. Miserably. They were never good enough. Cookies were but one baking hurdle. Then came bars. I grew up eating one particular sweet treat that I longed for as an adult and never had the recipe. Lo and behold, as I meandered up and down the grocery store aisles one day, I was reunited with my childhood love, in sweet, delicious, dessert bar-form of course. 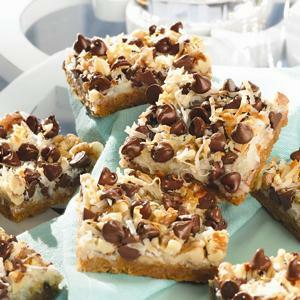 The Magic Cookie Bar. It is as elusive as it sounds and even more delicious than you could imagine. It's sweet and salty, gooey and crunchy. And painfully easy to make. Now, there are some recipes I keep secret; like my grandmother's shortbread cookie recipe. That's under family recipe lock n' key. The Magic Cookie Bar recipe, on the other hand, cannot, in good conscience, be kept a secret. Some things are just too good to not be shared. I made this for thanksgiving and everyone told me it was hello dolly, and i said no, its eagle brand, some easy cut square! But its my favorite!! !